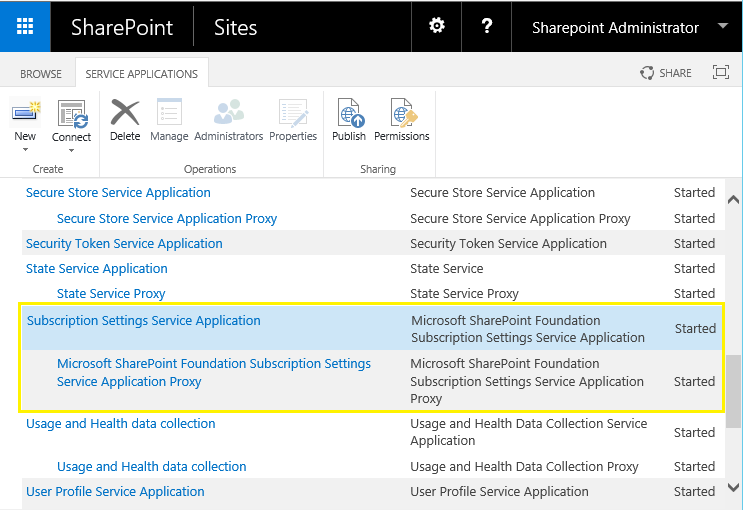 What is subscription settings service application in SharePoint? Well, SharePoint Apps platform relies on Microsoft SharePoint Foundation Subscription Settings service application. So, If you want to use Apps in SharePoint, its a prerequisite to create Subscription Settings service application. How to create subscription settings service application? Subscription Settings service application can be created only via PowerShell, There is no GUI to create this Service Application! Lets configure the subscription settings service application by using windows PowerShell. Don't forget to Change configuration parameters such as the service account, database name,etc on the below script as per your environment. Once done, run this PowerShell script from either PowerShell ISE or through SharePoint Server 2013 Management Shell. $ServiceAppName = "Subscription Settings Service Application"
Write-Host -ForegroundColor Yellow "Checking if Application Pool Accounts already exists"
Write-Host -ForegroundColor Green "Creating Application Pool"
Write-Host -ForegroundColor Yellow "Checking if Subscription Settings Service Application exists already"
Write-Host -ForegroundColor Green "Creating Subscription Settings Service Application..."
Write-Host -ForegroundColor Green "Subscription Settings Service Application created successfully!" Write-Host -ForegroundColor Yellow "Starting the Subscription Settings Service Instance..."
This creates subscription settings service application in SharePoint 2013 and SharePoint 2016.